Cuprinol produce a high quality, innovative range of wood care products, allowing you to look after your garden and brighten up any space. Whether you want a great oil finish for your decking or you fancy painting your garden fence a vibrant shade of blue, Cuprinol products are some of the best in the industry. Cuprinol are one of the leading brands in wood care products, with decades of experience and expert knowledge in creating the very best finishes for your garden fences, sheds and other wooden surfaces in your home and garden. Whether it's decking treatments, their 5-star wood treatment or various shades of brightly coloured paint for your garden shed, they are always coming up with effective ways to care for your outdoor space. Across the range they’ve incorporated tried and tested formulas to suit every application, from 5 year weather protection, frost protection, water repellant, anti-slip and UV Guards, you can trust Cuprinol's products to withstand the elements and offer a durable long-lasting finish. Their One Coat sprayable fence treatements are a hugely popular choice and allow for a quick and even application. 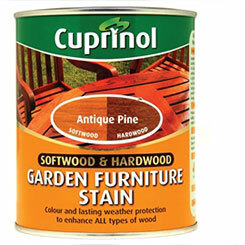 It's easy to transform your garden into a bright and inviting space, with our brilliant range of Cuprinol products.